Teasing apart the complex ways in which global warming will affect ocean life has been tough. But new research suggests that a simple ecological theory may explain at least one piece of the puzzle: the effect on marine food webs. And the news may not be all bad. New experiments confirm that phytoplankton, which form a bottom rung of oceanic food chains, will become less productive in warmer, nutrient-rich water. However, the results also show that zooplankton should boom in these warmer areas, which could benefit certain fisheries. The food-web theory hinges on the assumption that temperature affects the metabolism of organisms that rely on other creatures for food, like zooplankton, while not having much of an impact on photosynthetic organisms like phytoplankton. That suggests that in warmer waters, zooplankton should generally grow faster and start reproducing sooner than they do in cooler waters. As zooplankton become more abundant and eat more phytoplankton, the population of phytoplankton should shrink. 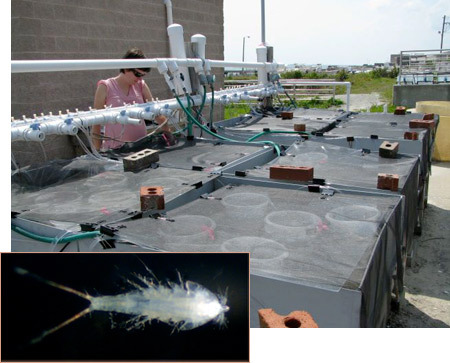 Mary O'Connor, now a postdoc at the National Center for Ecological Analysis and Synthesis in Santa Barbara, California, and her colleagues set up an experiment to test the theory. They put zooplankton and phytoplankton into 4-liter tubs and let them sit for 8 days. Some were kept at the ambient temperature; others were heated by 2°, 4°, or 6°C. Recognizing that nutrient levels vary in the ocean, they added extra nitrogen and phosphorous to half the tubs in each group. As temperatures rose, the productivity of the communities without extra nutrients hardly changed. Nor did the food web. This suggests to O'Connor and her colleagues that nutrient-poor food webs may be relatively resilient to global warming. The tubs that got additional nutrients were another story: The zooplankton in warmer water became more abundant while the numbers of phytoplankton fell. In fact, the ratio of zooplankton to phytoplankton rose 10-fold, the team reports in a paper posted online on 25 August in PloS Biology. "It matched our predictions really well," O'Connor says. She adds that even though overall biological productivity declined as temperature rose, the increase in zooplankton could benefit fish that eat them in nutrient-rich waters. Sommer notes that fish eat only certain kinds of zooplankton, so more analysis is needed to gauge the impact on the food supply. And physical differences between regions, such as currents and the stratification of the water column, will also complicate the response of food webs.